Above: a portrait thought to be of the teenaged Katherine of Aragon (left). The Archbishop's Palace, Alcala de Henares (right). On 16 December 1485, Queen Isabella of Castile gave birth to her fourth and final child, Catalina de Aragon, at the Archbishop's Palace at Alcala de Henares, north-east of Madrid. 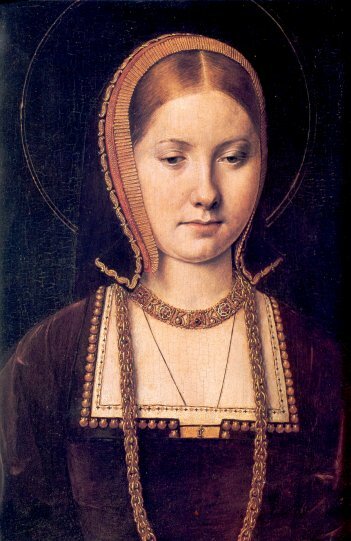 Catalina was, of course, known as Katherine of Aragon from the time of her arrival in England in 1501 to wed the eldest son of the king of England. Katherine was the youngest daughter of the 'Catholic monarchs', Ferdinand of Aragon and Isabella of Castile. She was named after her great-grandmother Katherine of Lancaster, daughter of John of Gaunt and his second wife Constanza of Castile. 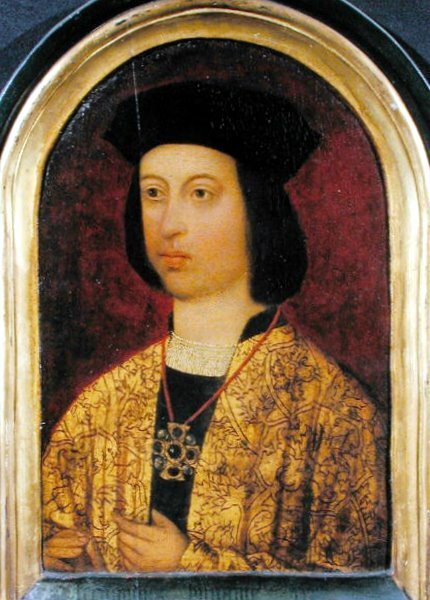 Although the royal couple were undoubtedly pleased with the birth of their daughter, a contemporary chronicler, Alfonso de Palencia, reported that they would have preferred a son, given the uncertain health of their only son and heir, Juan. Katherine was baptised by the Bishop of Palencia shortly after her birth, and was clothed in a white brocade gown trimmed with gold lace and lined with green velvet. During her early years, the princess accompanied her parents on their travels through Spain as they continued the war against the Muslim emirate of Granada. In 1492, Katherine was present at the ceremonial conquest of the capital of the former Nasrid kingdom. Historians have conjectured that her exposure from an early age to the war of conquest and her parents' intense struggle to eliminate heresy from Spain would have bred in Katherine a strong hatred of heresy and a belief in the righteousness of the Roman Catholic Church. Above: Isabella of Castile (left) and Ferdinand of Aragon (right), parents of Katherine of Aragon. From an early age, Katherine's personal emblem was the pomegranate, which symbolised fertility (ironically, as it turned out). Although she tends to be represented in popular culture as old, dowdy and dumpy, Katherine was in fact a beautiful girl famously diminutive in stature, with long reddish-gold hair, blue eyes, and a fair complexion. Sir Thomas More wrote of her upon her arrival in England: 'There is nothing wanting in her that the most beautiful girl should have'. Alison Weir noted that Katherine's youthful 'plump prettiness... was to enchant her two future husbands'. Katherine was educated by a clerk in holy orders, Alessandro Geraldini, and his brother Antonio, both of whom were Italian humanists. She studied arithmetic, Latin (and other languages), classical and vernacular literature, religion, and domestic skills. As Fraser notes, her strong religious upbringing helped to nurture and develop a faith that would sustain her during her turbulent life. The humanist scholar Erasmus was later to explain that Katherine 'loved good literature which she had studied with success since childhood'. Katherine came to be admired by both Erasmus and the Spanish humanist Juan Luis Vives as a model of Christian womanhood. Above: statue of Katherine at Alcala de Henares (left). Portrait of Katherine as queen (right). From an early age, Katherine was groomed for queenship. 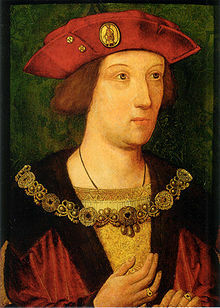 Henry VII, king of England, proposed that his eldest son Arthur wed the youngest daughter of the Spanish monarchs, to cement the Anglo-Spanish alliance between the two kingdoms. At this time, the Tudor dynasty was viewed as precarious given continuing insurrections against it and the lingering turbulence of the conflict known as the Wars of the Roses, and so an alliance with the prestigious and internationally renowned Trastamara dynasty would bolster the legitimacy and authority of the Tudors considerably. The Treaty of Medina del Campo in 1489 agreed that, when they reached an appropriate age, Katherine and Arthur would marry. Ten years later, on 19 May 1499, they were married by proxy. In the second half of 1501, the fifteen-year-old princess departed for England, where she would spend the remaining 35 years of her life. In November, she married Arthur at St. Paul's Cathedral. Tragically, her husband died only five months later, and Katherine was left a widow - almost certainly a virgin widow - at only sixteen. Above: Katherine's two husbands: Arthur (left) and Henry, later Henry VIII (right). 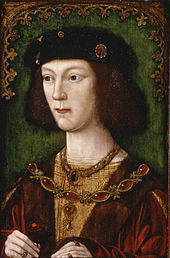 After a difficult and turbulent seven-year period in England, Katherine's happiness and future prosperity were secured when Henry VII died and his seventeen-year old son, Henry VIII, succeeded to the throne and chose to marry the beautiful and virtuous Katherine, aged twenty-three. The two were married at Greenwich Palace on 11 June 1509. Although, tragically, Katherine was never to bear her second husband a male heir, the royal couple could not have known that on their wedding day. To Katherine, a golden world beckoned, in which her future as England's queen seemed secured.